Our catalog is ever expanding. Feel free to check out some of the options below, but know that we are willing to create a solution that solves your exact problem or need. In fact, that is how many of the products you will see on our site originated - out of necessity to solve our customer's unique project challenges. Built for those who are looking for a creative space and cost savings. 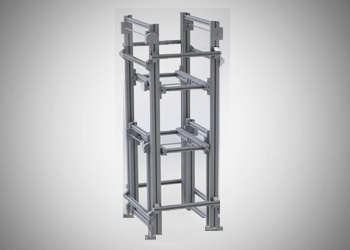 Support systems can be designed and built for Heavy Duty Lift and Locate stations. This will allow forces to be offloaded from the conveyor and into a support system designed specifically for your application. 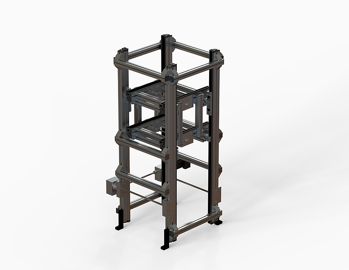 Shown here is an aluminum extrusion based Pedestal Support for a Heavy Duty Lift and Locate suitable for 1500 pounds of force. 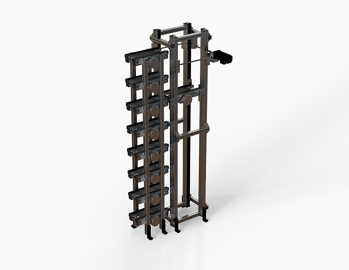 A vertical sortation and storage device to create a buffer of pallets either upstream or downstream (or both) of a machine. Allows an operator to load up a machine with unfinished goods and automatically load parts, and can even simultaneously unload parts as well. 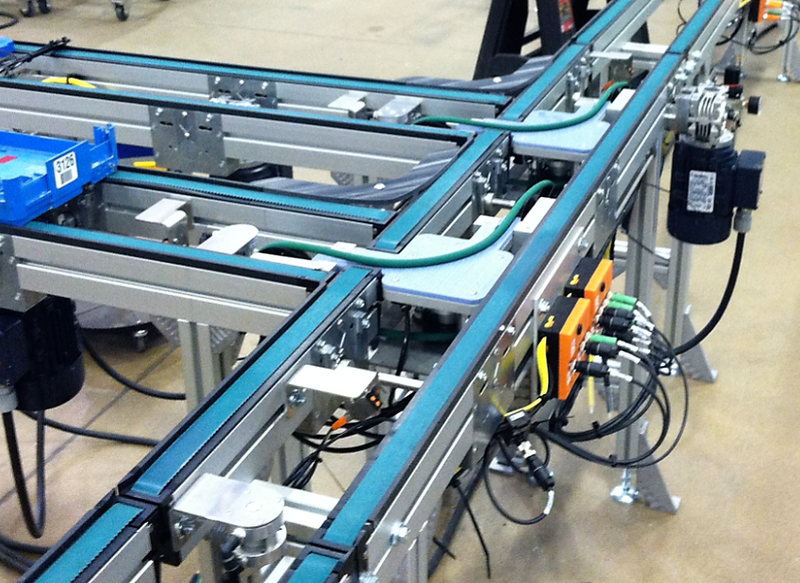 Glide-Line was able to drive four different conveyors off a single motor. This saves mechanical and electrical hardware cost. The purpose of the Centerline Adjustable Conveyor is to adjust the width of a conveyor – the dimension between conveyor strands. This system is built to handle specialty products that require additional support at an end to end transfer. 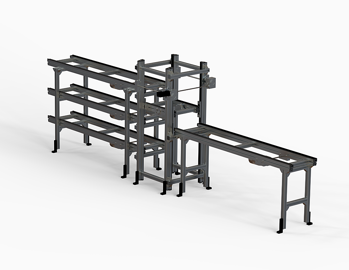 This is a conveyor that will provide support while a product is going over an end to end transfer. This product was developed for handling automotive tires. 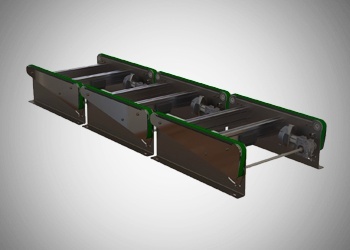 This is a zero pressure zoned conveyor designed to handle appliances with no pallet on the conveyor system. Appliances are conveyed directly on the conveyor belt. 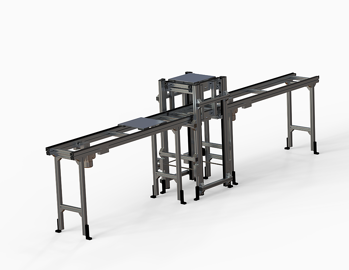 This is a zero pressure zoned conveyor designed to handle direct product contact with no pallet on the conveyor system. Products are conveyed directly on the conveyor belts. Allows for vertical transfer of product as well as tilting the conveyor deck up to 30° to allow for flexible access to the transport media. 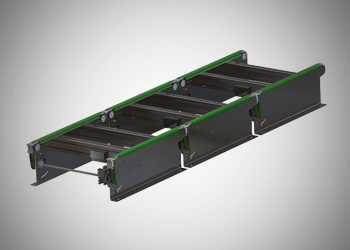 Two independently powered lift decks combined into one space to provide product bypass above the main line while simultaneously allowing undisturbed product flow to multiple positions. 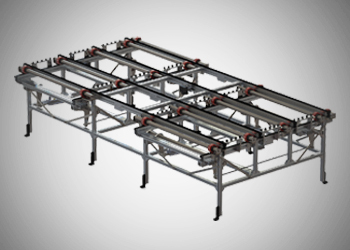 Allows for vertical transfer of product on two transport conveyors simultaneously. A buffering line for accumulating a large amount of product in a relatively small footprint. 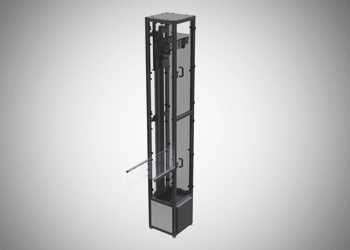 Allows for vertical lifting of pallet and rotation of 90 degrees. Allows for vertical transfer of product from one or more infeed conveyors to multiple discharge conveyors. 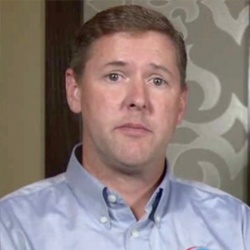 The total number of infeed and outfeed conveyors can be increased, as needed, to maximize product flow. The vertical transfer unit lifts product off the main line to prevent stoppage of product flow. 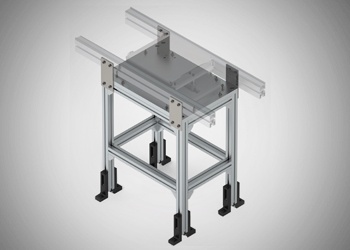 A Dual Deck Vertical Transport Unit that elevates product above main line to allow work to be done from above. Useful for performing the same process at multiple stations without disturbing product flow. Allows for product to be transferred 90 degrees to another conveyor line. Allows for vertical transfer of product to be stored on multiple independently driven stacked conveyors. 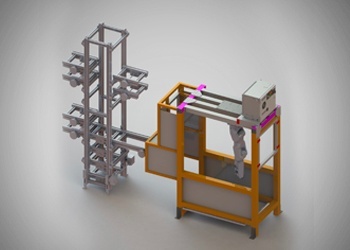 A Vertical Transport Unit feeds product to a rack of independently driven conveyors. Vertical Transfer Units (VTUs) transfer pallets from one level to another. 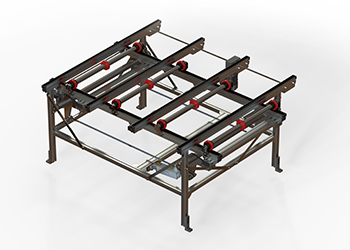 This unit utilizes a section of transport conveyor as an the platform and is actuated up / down (z-axis) by an electric motor - typically stepper or servo. 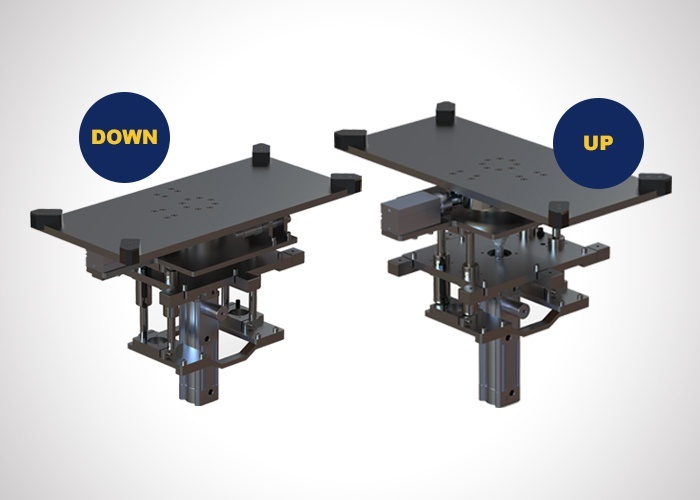 By driving the VTU with a servo or stepper, the VTU can be motion controlled for both smooth acceleration / deceleration as well as multiple stopping positions. 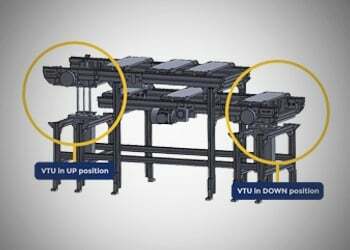 The VTU platform conveyor can operate in either direction, enabling the VTU to accept and discharge pallets from both sides. The unit is supplied as a stand-alone module. 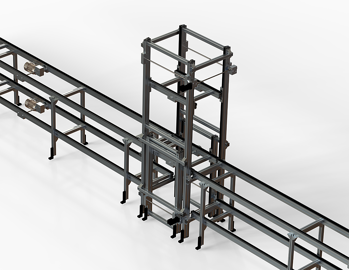 Allows for horizontal transfer of very large products from one conveyor line to another. If you still can't find what you need, fill out the form below to tell us about your limitations and restrictions. Our team of engineers can help you find a creative fix. 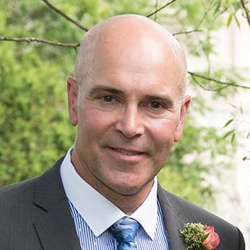 Below are some of the most common custom-standard solutions we've created for our customers. 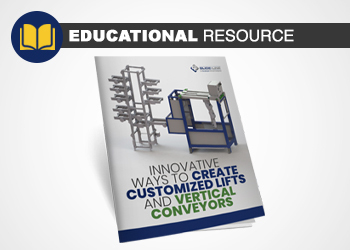 Here are some articles that feature flexible designs for your conveyor application solution. Here is an article on 5 Ways to Avoid Damage to Your Precision Product With Flexible Conveyors. If you have a question about the listed products or want to discuss your specific needs to see how we can help, let's talk. 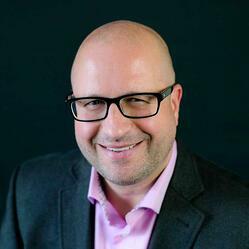 We're always ready to discuss options and solutions with you.